When you’ve sworn off high-calorie meals but still long for comfort food on cold nights, turn to this vegetarian braise. Escarole resembles an ordinary head of lettuce but is actually a member of the chicory family, along with the more familiar endive and radicchio. It has a pleasing, slightly bitter flavor and holds up well during cooking. Simmer the leaves in vegetable stock with garlic, herbs, and canned cannellini beans (don’t rinse them before adding to the pot because the bean liquid that clings to them adds body to the dish). 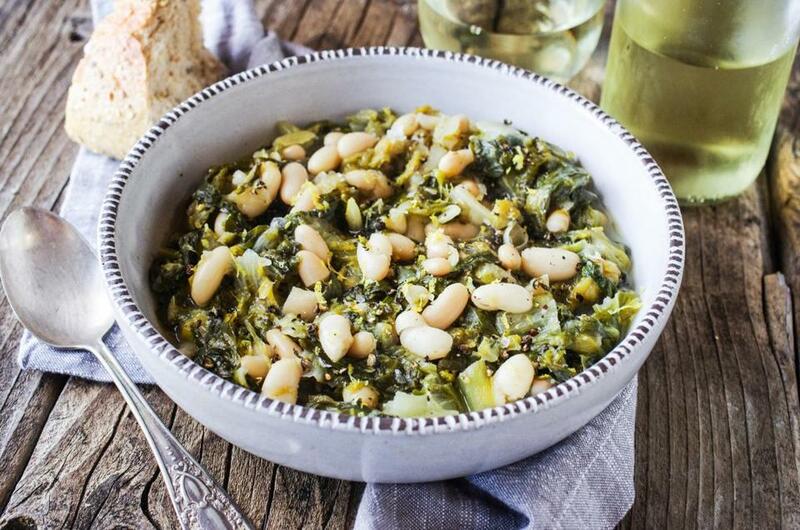 Once the greens are tender, finish the dish with grated lemon rind to add a little acidity. Serve with a crusty loaf to mop up the juices. 1. In a large, heavy-based flameproof casserole over medium-high heat, heat the oil and garlic. Cook, stirring, for 3 minutes. Add the thyme and fennel seeds; cook 1 minute more. 2. Working in batches, add the escarole to the pot. When the first batch wilts, add the next batch, and stir until all the leaves wilt. Repeat with any remaining greens. 3. Add the beans, vegetable stock, salt, and pepper. Bring to a boil, lower. the heat, and cover the pan. Simmer, stirring occasionally, for 20 minutes, or until the greens are tender.